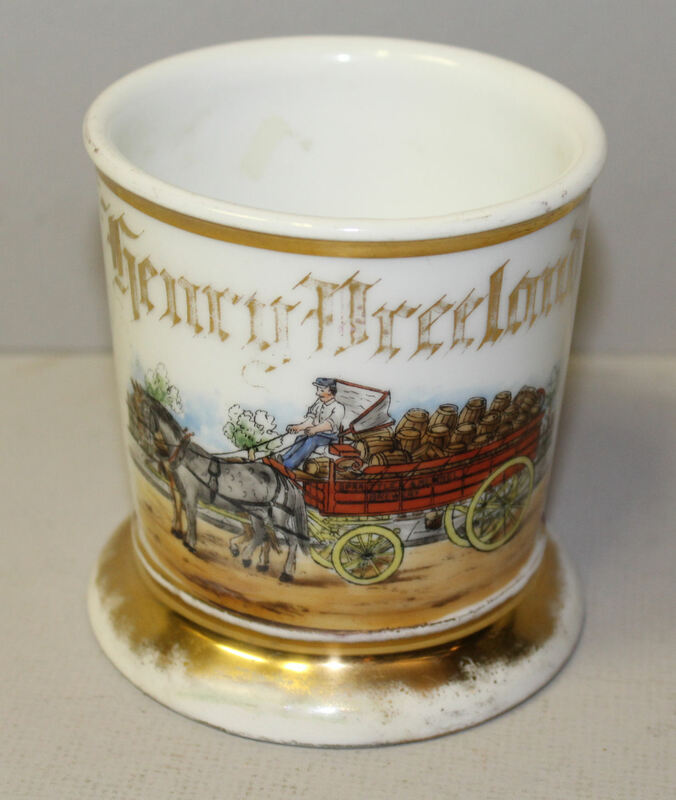 All original antique shaving mug that is personalized with the name, ‘Henry Freeland’ and notice that the mug depicts a horse drawn wagon that is carrying kegs of beer and notice on the wagon with beer kegs there is wordage that advertises, ‘Sprattler & Mennel Brewery’. Sprattler & Mennel Brewing was in Paterson, New Jersey (1876 – 1890). Sprattler & Mennel Brewery opened in 1870. As a Pre-Prohibition Brewery, Sprattler & Mennel Brewery was in an active brewing city. Paterson, NJ was listed as having 9 breweries, which is quite a few. This shaving mug measures 4″ high and has a base diameter of 4″ and the at the widest point is 5″ wide. Leonard Vienna Austria mug. Don’t miss adding this mug to your own personal antique shaving mug collection!